Management company Australian Ethical Investment has appointed a new chairman and board members, with André Morony stepping down as chairman at the end of February. Director Steve Gibbs was elected the new chairman. The new directors are Mara Bun, the founder and chief executive of Green Cross Australia, and Tony Cole who is a senior partner with Mercer. During my two years as Chair, Australian Ethical has faced a number of challenges not the least of which has been the difficult external environment all funds management organizations have faced, said Mr Morony. Mr Morony will stay on the board to ensure a smooth transition. Steve Gibbs is also a director of Hastings Funds Management and Chair of CAER (Corporate Analysis Enhanced Responsibility). Mara Bun previously worked for The Wilderness Society, Greenpeace Australia, Choice, the CSIRO and a number of financial organizations, including as a director of Allen Consulting Group. 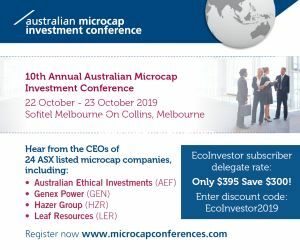 For the past 17 years Tony Cole has been a senior investment consultant and executive in Mercers Investment Consulting business, including heading the business in the Asia Pacific region for over five years. He was previously Secretary to the Treasury, Secretary of the Department of Health and Social Security, Deputy Secretary to the Department of the Prime Minister and Cabinet and Chairman of the Industry Commission which is now the Productivity Commission. See Australian Ethical Smaller Companies Trust. The Aspen Parks Property Fund has returned 12.2 per cent to investors since inception to 31 December 2012. Income distribution accounted for 10.2 per cent and capital growth 2 per cent. The one year performance was income of 9.5 per cent and capital growth 0.4 per cent for a 9.9 per cent. Continued equity inflows took gross assets to $307 million, allowing the Fund to progress a number of development projects and investigate potential acquisition. Gearing fell to a conservative 25.7 per cent net of cash as at 1 January 2013. The Fund has approved a major upgrade and relocation of essential services, such as the resort restaurant, at Monkey Mia Dolphin Resort in WA. The upgrade will promote key facilities and enable the park to capitalize on the strong tourist numbers visiting this unique world heritage listed environment, it said. In the shoulder holiday season leading up to Christmas the tourism and accommodation properties did well and many exceeded budget. But this has been offset by mining sector properties in the Karratha region of Pilbara Holiday Park and Balmoral Holiday Park where demand softened due to the postponement of the major Woodside infrastructure projects, Pluto 2 and 3. The Fund said occupancy levels in these parks, as well as competing properties, is below last year but should turn around quickly with the commencement of some significant gas projects in the latter half of 2013 which will drive demand for worker accommodation. The Fund has allocated $3.7 million to fund withdrawals during the 29 January to 28 February withdrawal window. Shares in Carbon Conscious fell to an all time new low of 4.4 cents on 7 February. The shares have been drifting downwards for over a year. The company says it has net tangible asset backing of 19 cents per share, but the fall is not good news for its share purchase plan at 5 cents per share which closes on 25 February. CBD Energy chairman, Mark Vaile has resigned, having previously announced his intention to step down prior to the companys Nasdaq listing. Gerry McGowan assumes the role of executive chairman, which he held prior to Mr Vailles appointment. Carlo Botto has been appointed to the board. Originally an electrical engineer, Mr Botto has energy industry experience in Australia, North America and Asia, and has been assisting CBD on strategy and development. He is the principal of Brighter Energy, which provides consulting services to the energy industry, and is a director of several energy companies. CO2 Group can now register almost 30,000 hectares of reforestation carbon projects that it manages under the Carbon Farming Initiative (CFI) and commence the production of Australian Carbon Credit Units (ACCUs) following a successful CFI Methodology Determination for its Reforestation and Afforestation Methodology from the Domestic Offsets Integrity Committee (DOIC). The ACCUs are tradeable under the Australian Carbon Pricing Mechanism. CO2's Reforestation and Afforestation Methodology Determination is the first privately developed methodology in the forest sector to reach the Determination stage and the first to apply in field carbon accounting approaches. This is a highly complex and technical piece of work that leverages CO2 Groups 10 year investment in developing commercial scale, carbon accounting systems, and follows 18 months of working through the DOICs rigorous review process, said Dr Bulinski, director, CO2 Australia. Greencaps shares fell to a one year low of 5.3 cents on 6 February following the resignations of two directors and the announcement of an expected 27 per cent fall in underlying earnings for the first half. The directors were Scott Bird Regional Director Western Australia, who founded WA based subsidiary ENV Australia Pty Ltd; and John Todd Regional Director of South Australia and Northern Territory, who founded South Australian based subsidiary AEC Environmental. Duncan Whitfield will take on both roles in a now combined Western Region comprising WA, SA and NT. New structures and operating processes will be implemented in WA and the Western Region to give greater client focus, drive integration benefits and manage costs. Further management changes will be announced shortly. Revenue from continuing operations for the first half is anticipated to be around $32 million, about the same as last year, but underlying earnings are likely to fall 27 per cent to around $2 million. This reflects a poorer trading result for the November/ December period, particularly in WA. On the plus side cash flow improved to $2.8 million and net cash improved to $1.4 million. The company will book losses of $0.7 million from discontinued operations including the closure and impairment of goodwill of MC2 and litigation costs for the settlement of TRH historical claims. Performance improvement programs include: restructuring senior management, reducing costs for service delivery, aligning business locations with growth markets, and reconfiguring the go to market delivery model to better market its integrated service offering. Galaxy Resources has recommenced operations at its Jiangsu Lithium Carbonate Plant in China following clearance from the Zhangjiagang Safety Bureau, which has approved Galaxys repairs to the section of pipe in the sodium sulphate crystallisation area that ruptured in November 2012. The plant should be fully operational and producing lithium carbonate within a week. Australian Renewable Fuels (ARfuels) and Wentworth Holdings have both said that ARfuels takeover offer for Wentworth will not succeed, and thus ARfuels has agreed to separately raise $12.3 million at 0.7 cents per share. The raising comprises a placement of $4.27 million and a 3 for 8 entitlement offer of $8 million to shareholders. The placement and entitlement offer are both supported by ARfuels largest shareholders, Lignol Energy Corporation and Thorney Holdings Pty Ltd, as well as new corporate shareholder Wentworth and other institutions. This demonstrates the strong support and confidence of those parties in the ARfuels business, it said. Wentworth and Thorney have underwritten the $8 million entitlement offer. The funds will be used for working capital and to repay Arfuels current senior debt facility. ARfuels said its takeover bid has a 90 per cent minimum acceptance condition, with current acceptances at 42 per cent, and it considers that the minimum acceptance condition is unlikely to be satisfied given the stated intentions of key Wentworth shareholders. Accordingly, it does not intend to waive or alter the bid conditions, and the bid will likely lapse. Green Invest and its joint venture partner, Indsol Pty Ltd, have launched the Green Building Store, an on line store for industry and domestic customers that offers plumbing, electrical and other building products focused around sustainability and efficiency. Brands include Stiebel Eltron, Apricus, Enware, Chromagen, Ifo, Delabie, Mitsubishi, Green Lighting Corp, Infinity Energy Group and Tankworks. Green Invests industry partners will receive an industry discount which will be extremely competitive with other wholesale distributors, and the Green Building Store will offer an installation service for domestic customers, said chairman, Peter McCoy. He also said that Green Invest will offer Australian municipalities and utilities a similar program to the Green Plumbers program currently underway in the US. Previous attempts by Green Invest to become a principal contractor have been commercially unsuccessful here, but it says that this time the strength of the underlying brand has been validated and it will offer a combination of quality product and training coupled with a unique finance model. The commercialization of its brands will involve making endorsed product available to Green Plumbers and others through the on line store Green Building Store (www.greenbuildingstore.com.au), relationships with Master Plumbers and others to introduce the selected products to the plumbing and later to the electrical industry, and identifying a target market and providing it with suitable environmental products and installation. Phoslock Water Solutions US licensee, SePRO Corporation, completed the first application of Phoslock to a public waterbody in Florida. The application totaled 42 tons and the county authority responsible for the lake will monitor the changes in water quality over coming months. Dart Energy has acquired PEL 445 in the Clarence Moreton Basin of NSW, describing it as a highly prospective exploration licence with significant potential gas resource to address the states expected domestic gas shortages. At the same time Coalition energy and resources spokesman Ian Macfarlane has urged AGL and Dart Energy to abandon coal seam gas projects in populated areas until the effects are better understood. The vendor of PEL 445 is Arrow Energy, which is owned 50:50 by Royal Dutch Shell plc and PetroChina Limited. Dart Energy said it will make a modest cash payment to Arrow Energy that reflects the status of the licence, the level of understanding of its resource potential and that Dart Energy is assuming all outstanding licence obligations. The agreement is conditional on approval for the transfer of the licence by the NSW Department of Trade and Investment, Regional Infrastructure and Services. PEL 445 is Arrow Energys only licence in NSW and is non core to its Queensland focus. It covers 7,100 square kilometres and is adjacent to the border of NSW and Queensland and to tenements held by Metgasco and ERM. Based on the work so far by Arrow Energy and others, the basin is thought highly prospective for coal seam gas and other unconventional and conventional gas deposits. Since 2002, Arrow Energy has drilled 15 exploration wells. Exploration results indicate that the area contains significant gas resources, which are over pressured, contain significant free gas, and are generally close to 100 per cent saturation with a gas composition regularly over 95 per cent methane, it said. Dart Energys management team is familiar with the licence area as they carried out the majority of exploration work done to date while they were at Arrow Energy. Meanwhile, the Australian Financial Review reports that Mr Macfarlane backed the coal seam gas concerns of Labor MPs and urged the NSW government to freeze coal seam gas development in the state's populated areas. "Mr Macfarlane has told gas companies including AGL and Dart Energy that they should abandon CSG projects in western Sydney, the Hunter Valley and the North Coast of NSW until there is more certainty about the effects," it says. "He contrasted the concerns in NSW with the approach in Queensland where the state government had established a two-kilometre exclusion zone around houses and there was growing acceptance of the industry by landholders. "In NSW, I think the industry is on the brink of collapsing," he told The Australian Financial Review." "My advice to industry has been that they concentrate on areas away from rural and urban populations. I think the state government probably should be saying We need to put this on hold in these regions and concentrate on areas less controversial until we get a few runs on the board'." "Federal Environment Minister Tony Burke has demanded the NSW government respond within a week to his call for more rigorous independent scientific assessment of CSG proposals, after pressure from independent MP Tony Windsor." Carnegie Wave Energy is aiming to raise up to $6 million through a share purchase plan. Shareholders can buy between $3,000 and $15,000 worth of shares at 3.2 cents each. The funds will be used to fund the commercialization of the CETO wave energy technology including Carnegies first wave to wire commercial demonstration project and for working capital purposes. The offer closes on 13 March. The company has received a milestone payment of $669,700 from the WA Government for the completion of the detailed design of the Perth Wave Energy Project. It is also submiting a claim for a similar amount to the Australian Renewable Energy Agency (ARENA). Island Sky expects to finalize its future business activities during this quarter and does not expect to continue with negative operating cash flows similar to those in the December quarter, it said in response to an ASX query about its cash position.